The world of video games and arcades have mostly been home to action or fighting game titles. 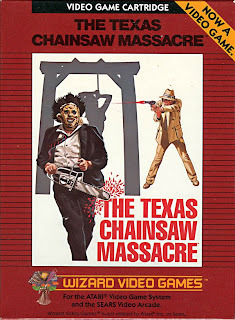 Horror games were, at one time, few and far between. When Atari and other home systems became the rage in the 1980s, game cartridges built around ghouls and spooky shenanigans remained a small market. There were popular titles like CASTLEVANIA and GHOSTS N GOBLINS and of course the infamous FRIDAY THE 13TH and TEXAS CHAINSAW MASSACRE games; but the market for at-home-horror-gaming didn't hit in a massive way till the late 1990s with a title that has become as synonymous within the video game lexicon as PAC MAN and MARIO BROTHERS. 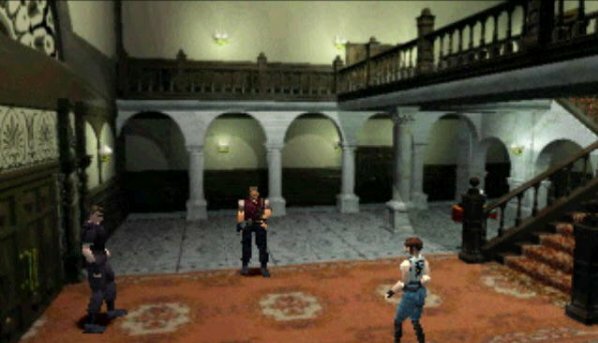 Emerging in 1996 to both great sales and acclaim, RESIDENT EVIL presented a terrifying new landscape for at-home gaming entertainment. 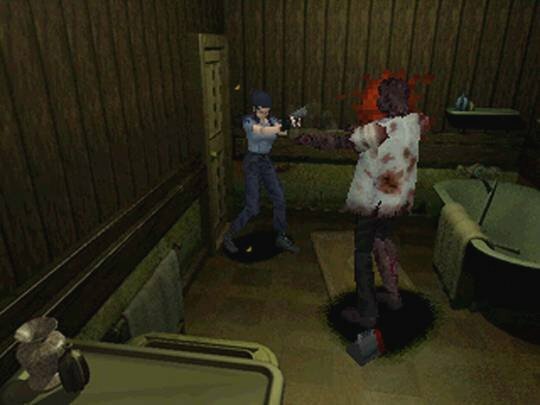 RESIDENT EVIL (called BIOHAZARD in Japan) was guided by notable game designer, Shinji Mikami, who was also largely instrumental in popularizing the gaming genre known as 'Survival Horror'; the terminology denoting any game that puts the player, or players in a life-threatening, extremely dangerous situation, often with limited resources and an ever growing array of frightening monsters. FEEL THE FEAR! CAN YOU HANDLE THE HORROR? I remember the first time I experienced this groundbreaking game. It was in 1997. 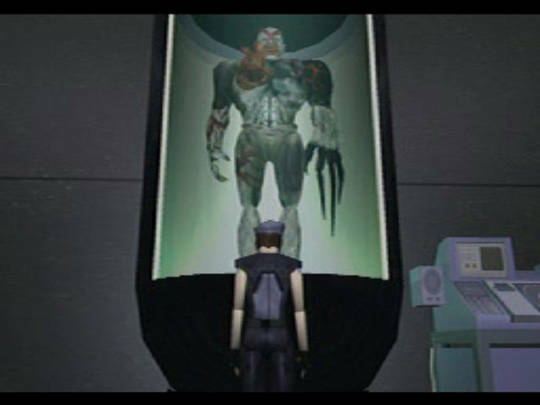 I had seen posters and in-store ads for RESIDENT EVIL, but wasn't aware just what it was at the time. Also, arcades and gaming systems had lost their luster where my interest in them was concerned. Even so, I decided to buy a Sony Playstation; mostly so my brother would have something to do when he stayed at my house while I was working. While I enjoyed engaging in duels within the BATTLE ARENA TOSHINDEN, it was RESIDENT EVIL that stole my heart; actually, it was more like ripping it from my chest and consuming it. 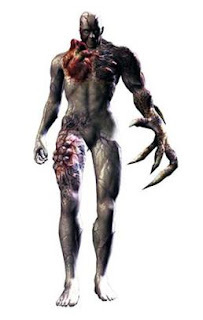 The story deals with the STARS Alpha team being sent to locate survivors of Bravo team, whose chopper had went down on the outskirts of Raccoon City. 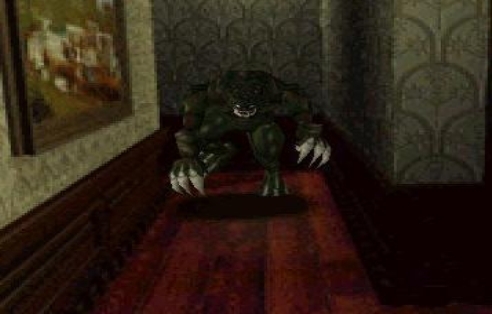 No survivors are found, but they are chased by mutant dogs into an ominously spooky mansion that is seemingly deserted. 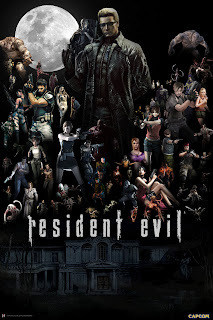 Over the course of the night, the remaining Alpha team members uncover frightening monstrosities and horrifying experiments tied to the Umbrella Corporation. Ultimately, I ended up getting addicted to wandering around that creepy, isolated mansion with horrors of all shapes and sizes waiting around every corner. 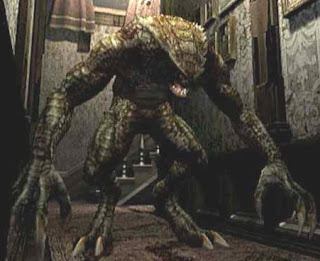 I never actually played the original version of RE, but in 1997, I purchased a re-release that was called RESIDENT EVIL: DIRECTORS CUT. A number of modifications were made, such as re-arranging items found in the mansion, different camera angles and two additional gaming modes. 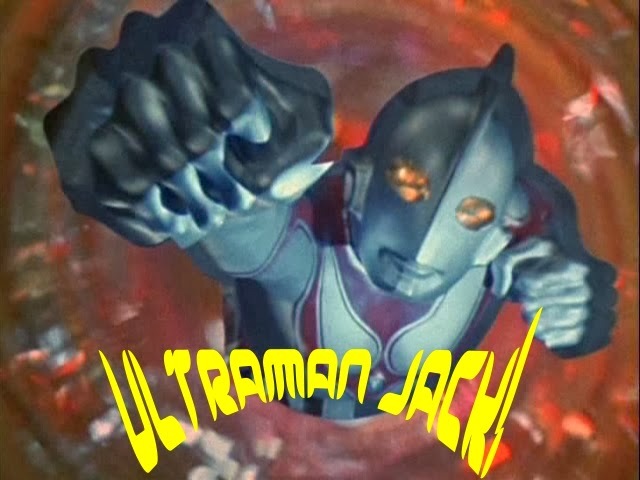 The censored Full Motion Video sequence seen at the beginning was supposed to have been presented uncut, but some sort of QC issue with the developers resulted in the games beginning movie to be the same cut version from the original '96 release. Since I'd never played the game before, it didn't bother me too much. The Director's Cut also came with a second disc that contained a demo for the highly anticipated release of RESIDENT EVIL 2. When I bought the game, an employee told me I had to have the strategy guide, or it would be near impossible to get through without it. Granted, I didn't have a computer at the time, so finding a walkthrough online wasn't an option then. So I came home and hooked up the Playstation system along with the speakers I had for that extra 'Boo' effectiveness. I was home alone this particular night and had no idea just what the hell I was in for. 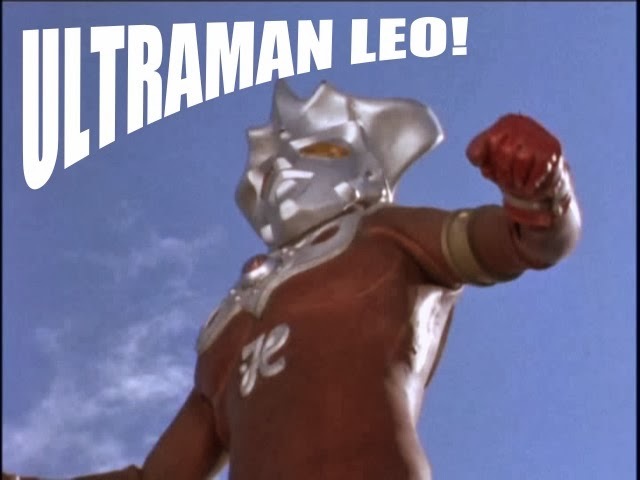 The horrid voice acting had me laughing at first, but little did I know what was soon to come. One of the first things that stood out to me were the eerily realistic pre-rendered backgrounds that the three dimensional characters move around in. 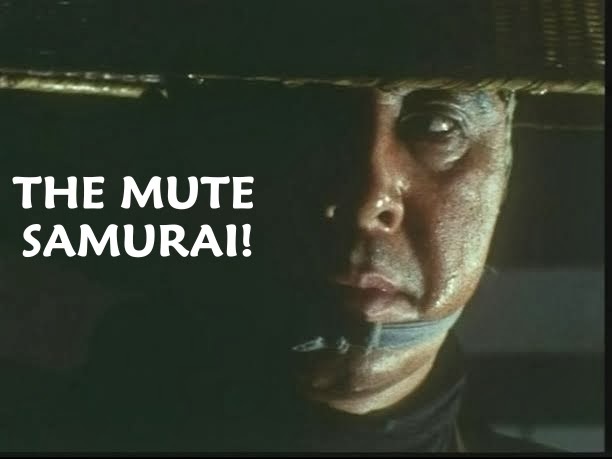 That, accompanied with superb sound effects and stunningly creepy music cues only added to the nightmare. 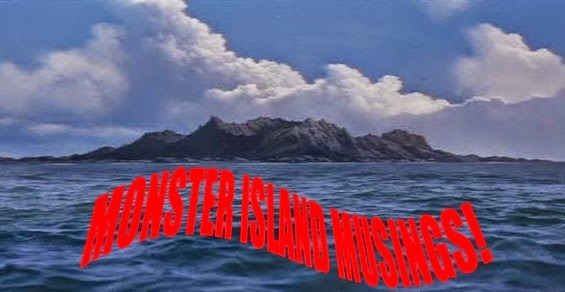 It didn't take me long to realize that when you entered an area without any music playing on the soundtrack, that meant something was going to jump out at you from somewhere; it was only a matter of when and where. 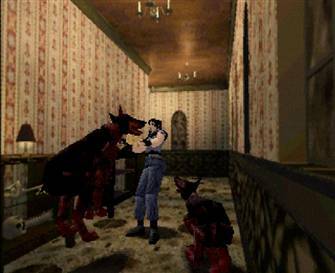 The moment I realized how potent jump scares were on a video game occurred the moment the dogs jumped through a window and attacked me. Dropping the controller did nothing for my characters life expectancy. I died a few times before finally being able to progress. About halfway through the game, I thought I had gotten the hang of it. 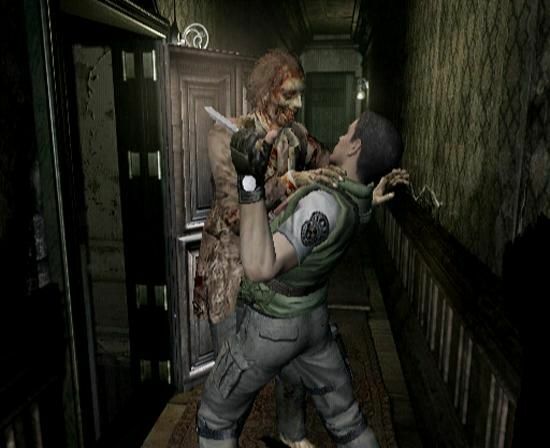 But upon re-entering the mansion, all the zombies are gone, but they're replaced by some new, even more deadly menaces. 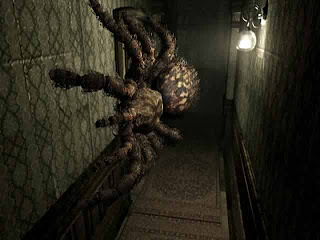 These scary bastards called Hunters started cropping up everywhere and the ceilings were now littered with gigantic hairy spiders! 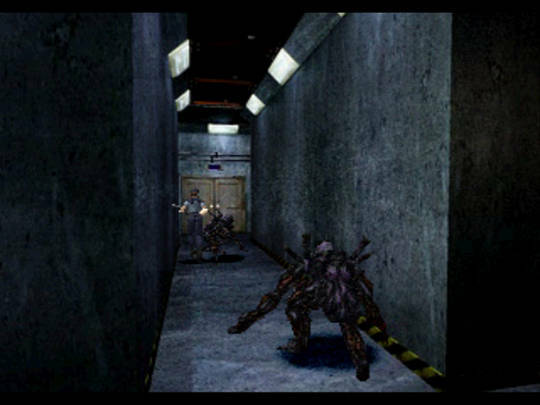 The Hunters (GameCube remake Hunter above; Playstation 1 Hunter at right) were particularly pesky and far more difficult to kill than a zombie. They possessed the uncanny ability to leap into the air and take your head off with a single slash of their enormous clawed hands. 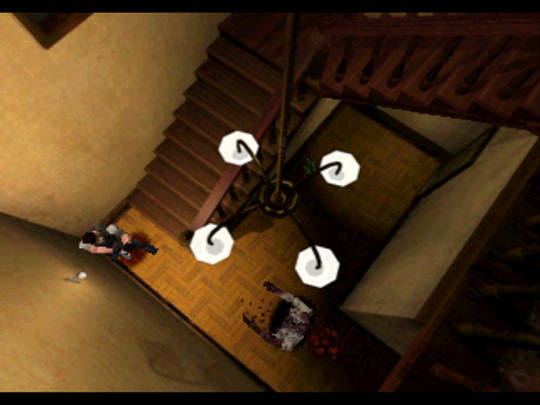 I remember one spot in the game involved going down a hallway to solve a puzzle that would reward you with the magnum gun. To get there, you had to encounter THREE of the Hunters! 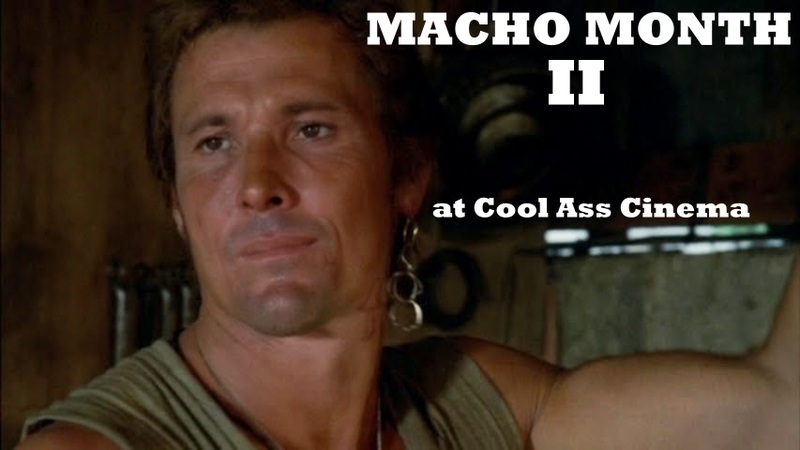 I remember gushing an enormous sigh of relief upon finally getting past the triple threat of these head Hunters and getting a Magnum which could put them away in a single shot. Among the other monsters both in, around and underneath the mansion are an outsized cobra (you fight this guy twice; above photo from the REmake), a giant man-eating plant, killer crows, more zombies, these hairy, insectoid, ape-like creatures called Chimeras and the formidable Tyrant, the main monster of the game. You encounter him twice, too. Having to take on, and take out such a high level of creatures means you need weapons. RE boisterously earned the 'Survival Horror' moniker with its limited ammunition and inventory system. 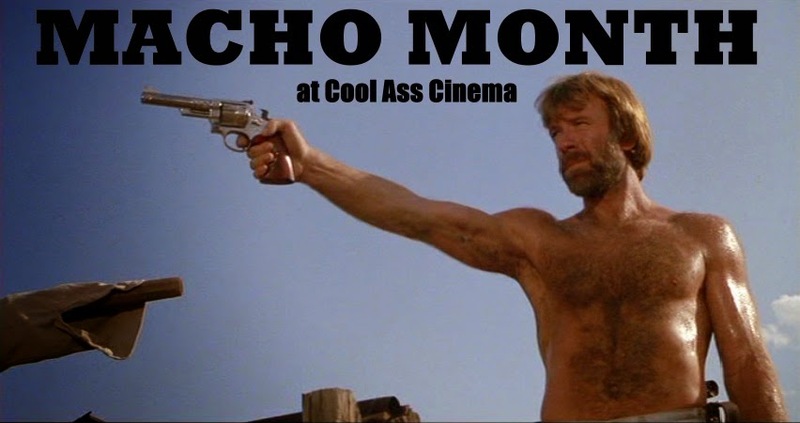 You really had to be careful how you used your guns. You didn't necessarily have to shoot every obstacle in your way. I found this out the hard way. Of course, if you ever returned to a particular room or area, the monsters you left alive would still be there waiting on you. 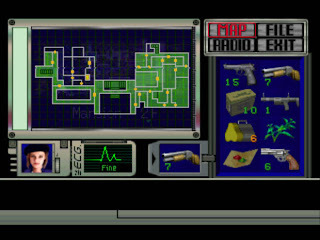 Your inventory was also small, so you had to make drastic decisions about what to take with you and what to put in these inventory chests placed in safe rooms throughout the game. 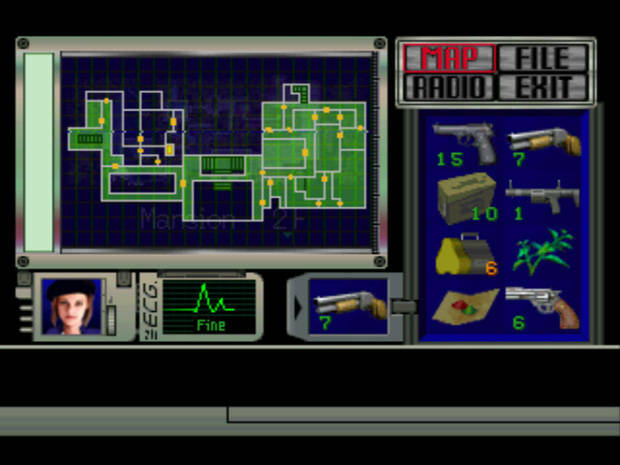 See the image below to see what your inventory screen looked like on the first RESIDENT EVIL. Saving your game was also a strategic decision. You could only do so by using a typewriter(!) and with a ribbon. These ribbons also had a limited number of times you could use them. After that, you had to find another one, so you were forced to re-think not only how you played the game, but also in how you saved it, too! Your health aids were these first aid sprays (that completely replenished your life) and herbs that came in three colors--green, red and blue. You could also combine these for potency, and some you couldn't use by themselves. Three green herbs combined raised your life all the way, as did a single green and a red herb. 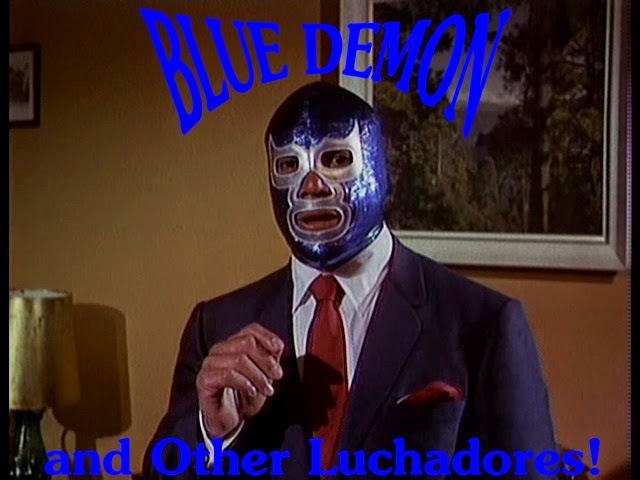 The blue herbs were only for curing poisons endured by toxin spewing creatures. Like the red herbs, blue herbs can't be taken by themselves, you had to combine them with a green one. Again, you were faced with what to take with you and how much. As frustrating as this could get, it made for an immensely satisfying experience, and only aided in the intensity and those great jump scares. I hadn't been playing long when a bunch of friends came over one night and all four of us took turns playing it. One would hold the strategy guide and tell the one playing where to go. The four of us swapped out every time one of us died. 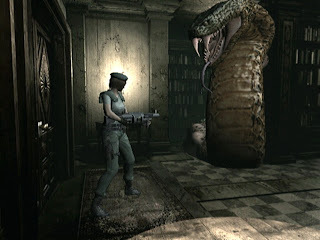 I think we played RESIDENT EVIL for at least two months. The ending took forever to beat, it was so intense at the time; the Tyrant was one creepy beast. 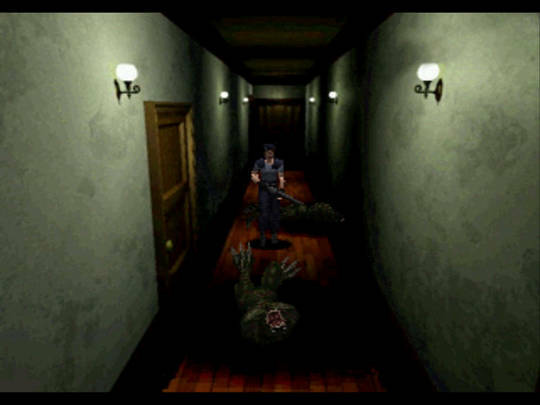 Of course his fright factor has come a long way since the once cutting edge Playstation graphics of the late 1990s. 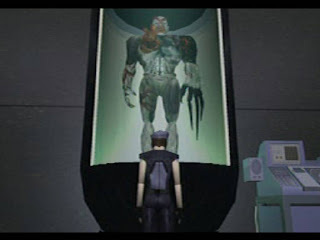 RE's finale also showcased a plot device that would become a mainstay of the series, a countdown timer that had to be met or else your atoms were scattered for miles, or as the game would splash across the screen, "YOU DIED". The beauty of the game was that it was so well planned and laid out, you truly got the impression YOU were actually there taking on flesh-eating zombies and a menagerie of monsters. It was an exhilarating experience I never imagined I'd get from a video game. The first RESIDENT EVIL may look outdated today, but at the time, there was no denying its ability to instill fear and pure terror in those holding the controller.